It is rare to become a national-class athlete in any sport. Molly O’Rourke, a 2001 graduate of Oak Harbor High School, accomplished the feat in two, judo and powerlifting. •Two-time national champion (2005, under 78kg; 2011, over 78kg). •Former No. 1 ranked judoka in both classes. •2011 Pan American games team member. •2013 International Powerlifting Federation Classic World Champion-ships silver medalist. •California state record holder in squad (424 pounds), bench press (281 pounds), dead lift (485 pounds) and total (1,190 pounds). O’Rourke, who will turn 31 in a few weeks, began her judo journey just before entering high school in 1997. Five years later she moved to Berkeley, Calif. (where she still lives), to train with David Matsumoto at the East Bay Judo Institute. By 2003, she was among the best in the United States. She earned a bronze in the senior nationals that year and added a silver the next. She also won a silver medal at an international meet in Montreal in 2003. Those accomplishments lifted her to the No. 1 ranking in her division and earned her an invitation to the 2004 Olympic tryouts, where she placed second. She added a national title in 2005 and competed for the United States in the world championships in Cairo. A knee injury sidelined O’Rourke for eight months, but she bounced back to get third in the national tournament and earned another Olympic trials bid in 2008. She began powerlifting for fun with a competitive lifter, Ben Autrey, who is now her boyfriend. Two years later (2010) she began competing. 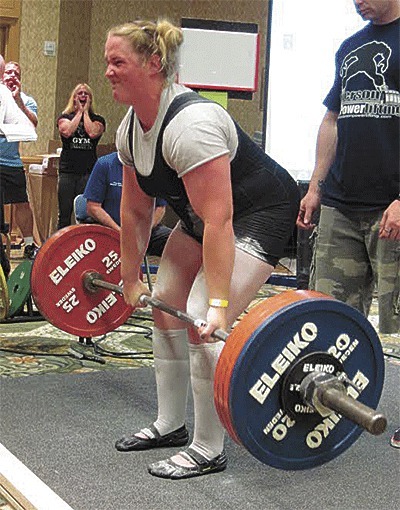 In her first tournament she totaled 920 pounds, including a deadlift of 390, which qualified her for her first invitational, the Olympia in Las Vegas. O’Rourke has earned a spot at the Olympia each year since. Bigger and stronger, she decided to give judo another go. Now a super heavyweight, O’Rourke finished second at the senior nationals in 2010 and first in 2011, earning a spot on the Pan American Games team. She finished fifth at the games in Guadalajara, Mexico, one month after winning the Olympia deadlift competition (451 pounds). Once again, she decided to “retire” from judo and focus on qualifying for the 2013 IPF Classic Work Championships in Suzdal, Russia. She earned a spot on the team and excelled at the meet, winning gold in the bench press (270 pounds), silver in total weight (1,150 pounds) and deadlift (474 pounds) and bronze in squat (408 pounds). O’Rourke, who works as a personal trainer, expects to reach those goals this year. She competes in the “raw” style with no equipment; she doesn’t even wear a belt, which is legal. O’Rourke has won two national USA Powerlifting Association championships and one in USPAL. Since there are multiple governing bodies in powerlifting, “the title ‘national champion’ is a bit of a stretch,” O’Rourke said.